And how can this be healed? Yeshua says the answer cannot be found from human sources. He clearly says that the solutions can only be obtained from Him. Only. “I counsel you to buy from Me gold refined in the fire, that you may be rich; and white garments, that you may be clothed, that the shame of your nakedness may not be revealed; and anoint your eyes with eye salve, that you may see” (Revelation 3:18). I decided to study this verse very thoroughly, and I’ll take you along with me, okay? First, let me show you my extreme grammar geekiness, because when I find a verse that seems extremely important, with vital “health information” like this one has, I want to be sure I know how every word functions. I don’t want to miss a drop of my prescription! Anoint our eyes with eye salve. The first prescription (gold) can only be bought from Yeshua, so it is implied that it’s the same with all three. So let’s look at each item. Revelation is the last book of the Bible, so if a symbol is given here, the logical thing is to ask ourselves if the word is defined somewhere else first. Gold is easy, because the Scriptures very clearly define it. And in keeping them there is great reward” (Psalm 19:7-11). 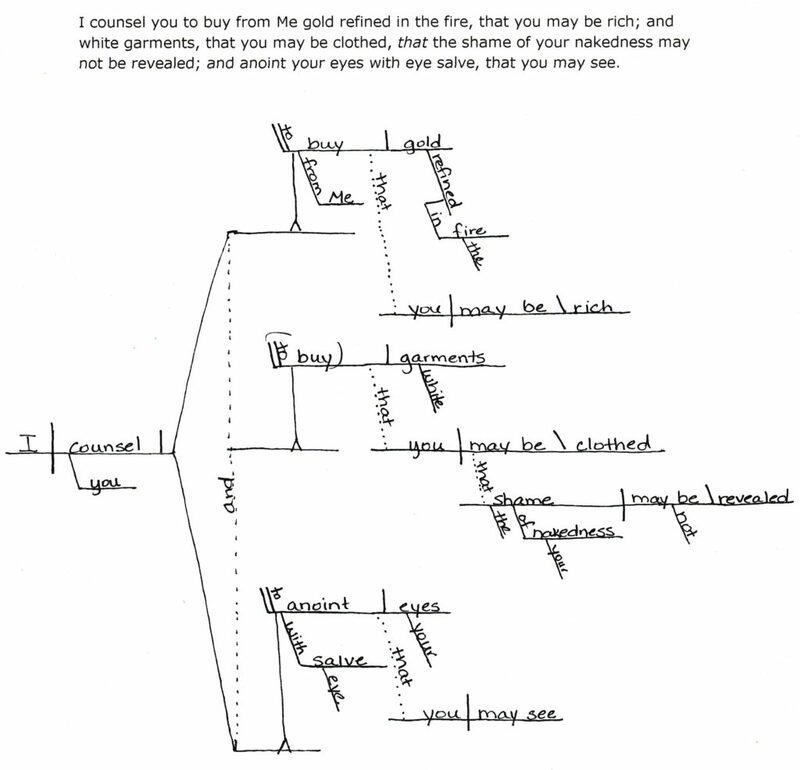 The law, testimony, statutes, commandment, fear, and judgments of YHVH are fine gold. It couldn’t be any clearer. Yeshua says we think we’re rich, but we don’t realize we’re wretched, miserable, and poor. In fact, it was right around the time that the book of Revelation was penned (around A.D. 96) that the Torah, the law of God, was thrown out of the early Christian congregations as they made every effort to separate themselves from “Judaizers.” The result was an anemic form of godliness that persists to this day. The truth of Jesus Christ has gone out to the ends of the earth, but the Seed has been choked as it has mixed with the fleshly seed of wickedness. Isn’t His Torah impossible to keep? Not unless God is a liar! How expensive is His gold? Hear, and your soul shall live” (Isaiah 55:1-3). “Hear, O Israel: YHVH our God,YHVH is one! You shall love YHVH your God with all your heart, with all your soul, and with all your strength. And these words which I command you today shall be in your heart. You shall teach them diligently to your children, and shall talk of them when you sit in your house, when you walk by the way, when you lie down, and when you rise up” (Deuteronomy 6:4-6). White garments are easy, too, because they are defined right in the book of Revelation. “Let us be glad and rejoice and give Him glory, for the marriage of the Lamb has come, and His wife has made herself ready. And to her it was granted to be arrayed in fine linen, clean and bright, for the fine linen is the righteous acts of the saints” (Revelation 19:7-8). So when we buy white garments from Yeshua, we are putting on righteous acts. “And YHVH commanded us to observe all these statutes, to fear YHVH our God, for our good always, that He might preserve us alive, as it is this day. Then it will be righteousness for us, if we are careful to observe all these commandments before YHVH our God, as He has commanded us” (Deuteronomy 6:24-25). “The entirety of Your word is truth, and every one of Your righteous judgments endures forever” (Psalm 119:160). “Whoever commits sin also commits lawlessness, and sin is lawlessness. And you know that He was manifested to take away our sins, and in Him there is no sin. Whoever abides in Him does not sin. Whoever sins has neither seen Him nor known Him. Little children, let no one deceive you. He who practices righteousness is righteous, just as He is righteous” (1 John 3:4-7). “Therefore, beloved, looking forward to these things, be diligent to be found by Him in peace, without spot and blameless; and consider that the longsuffering of our Lord is salvation—as also our beloved brother Paul, according to the wisdom given to him, has written to you, as also in all his epistles, speaking in them of these things, in which are some things hard to understand, which untaught and unstable people twist to their own destruction, as they do also the rest of the Scriptures. “You therefore, beloved, since you know this beforehand, beware lest you also fall from your own steadfastness, being led away with the error of the wicked [lawbreakers, Greek athesmos]; but grow in the grace and knowledge of our Lord and Savior Yeshua the Messiah” (2 Peter 3:14-18). We are to be found without spot and blameless when He comes. We are to steadfastly grow in the grace and knowledge of Yeshua our Messiah, and we are stay away from the error taught by those who teach against Torah. Would He teach them something different than what His Father had commanded? Did Yeshua “fulfill” the Law, setting it aside so that we no longer had to obey His Father’s commands? “I do nothing on my own but speak just what the Father has taught me” (John 8:29). “To this you were called, because Messiah suffered for you, leaving you an example, that you should follow in his steps. He committed no sin, and no deceit was found in his mouth” (1 Peter 2:21-22). “Whoever claims to live in him must walk as Jesus did. Dear friends, I am NOT writing you a new command but an OLD one, which you have had since the beginning. This old command is the message you have heard. Yet I am writing you a new command; its truth is seen in him and you, because the darkness is passing and the true light is already shining. Anyone who claims to be in the light but hates his brother is still in the darkness” (1 John 2:6-9, NIV). And again in Revelation, we read that the saints who are clothed in fine linen, which is the righteousness of obedience to all the laws of God, are the same as those who put their faith and trust in Yeshua as Messiah. “Here is the patience of the saints; here are those who keep the commandments of God and the faith of Yeshua” (Revelation 14:12). And how to we cleanse our garments and put on new ones? So now we come to the third prescription, and this is the one that caught my attention, simply because I had been pondering spiritual blindness. I’ve been pondering this all week! Truly! I even put out feelers on my Facebook wall, to see if others could help me. One dear friend sent me to Isaiah 29, and it started to help. And he says, ‘I am not literate'” (Isaiah 29:10-12). Yes, I can see this is exactly the problem! Our churches are filled with Bible studies, sermons, study groups, Bible-based music, books about the Bible, Christian radio, you name it. However, people don’t understand what they read! They either close the Book and turn elsewhere for advice, or they turn to ear-tickling teachers who make more sense to their flesh. “So Philip ran to him, and heard him reading the prophet Isaiah, and said, ‘Do you understand what you are reading?’ And he said, ‘How can I, unless someone guides me? '” (Acts 8:30-31). 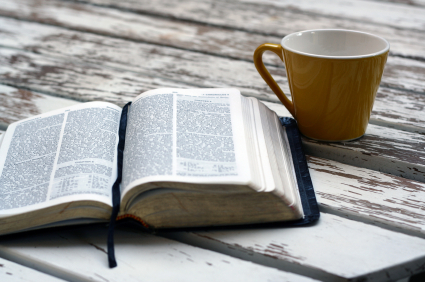 Eventually entire portions of the Bible (usually the Torah, such as Leviticus and Numbers, or the Prophets, snooze…) are ignored or read with large boosts of caffeine and bragging online that “I made it through Leviticus for the year… Ug!” People are told that much of the Bible “is not for today” and doesn’t apply to them. And the understanding of their prudent men shall be hidden‘” (Isaiah 29:13-14). The book becomes sealed. Our eyes are blind and we cannot see. So how do we find eye salve? How can we see again?!?! The only place I could find in the Bible that talked about eye salve was in the book of Mark. “Then [Yeshua] came to Bethsaida; and they brought a blind man to Him, and begged Him to touch him. So He took the blind man by the hand and led him out of the town. And when He had spit on his eyes and put His hands on him, He asked him if he saw anything. “Then He put His hands on his eyes again and made him look up. And he was restored and saw everyone clearly” (Mark 8:22-25). But let’s think about how profound this is! Spit comes from your mouth, right? 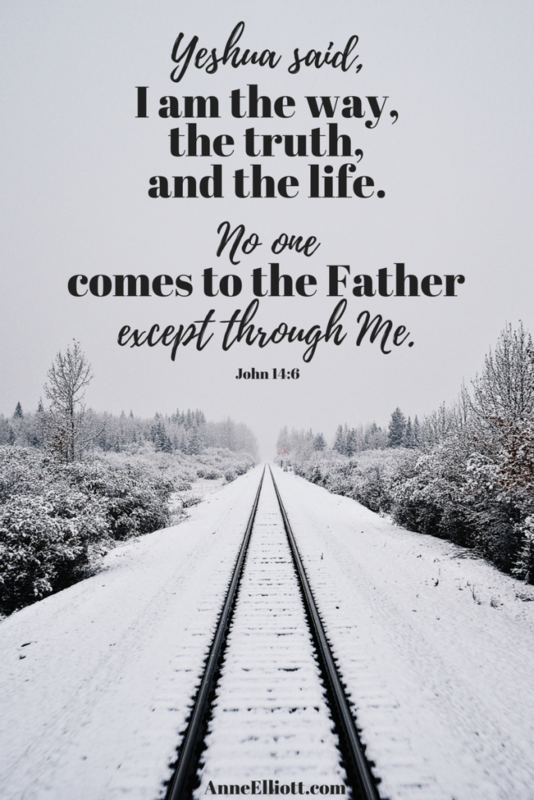 What else comes from Yeshua’s mouth? “Man shall not live by bread alone; but man lives by every word that proceeds from the mouth of YHVH” (Deuteronomy 8:3). If you were to look up the context of Deuteronomy 8, you’d clearly see that the “word” that procedes from the mouth of YHVH is nothing else but “every command that I am giving you today” (verse 1, and also verses 6 and 11). We also read in Deuteronomy that a Prophet is going to come, and we know that this Prophet is none other than the Messiah Himself. If Yeshua taught against the commands of His Father as given to Moses in the Torah, then He would be completely disqualified to be our Messiah! The very words of YHVH were placed in the mouth of Yeshua, the Prophet and Messiah foretold. His words! The spit that heals blindness! If someone were to tell you that the Torah, the commands of God, the very words in the mouth of Yeshua, were the only way to be healed from spiritual blindness, what would you do? Would you quickly wipe them off? And lay up His words in your heart” (Job 22:22). More than my necessary food” (Job 23:12). And all the host of them by the breath of His mouth” (Psalm 33:6, and see John 1:1-5). Nothing crooked or perverse is in them” (Proverbs 8:8, and see all of Proverbs 8). And it shall prosper in the thing for which I sent it” (Isaiah 55:11, a verse often quoted by Christians, but do we realize that it is referring to the Law of God?). “‘As for Me,’ says YHVH, “this is My covenant with them: My Spirit who is upon you, and My words which I have put in your mouth, shall not depart from your mouth, nor from the mouth of your descendants, nor from the mouth of your descendants’ descendants,’ says YHVH, ‘from this time and forevermore'” (Isaiah 59:21, a beautiful promise for the last days). I’m going to be blunt honest with you today! If your pastor teaches that we’re not “under” the Law any more, or that the “Law of Christ” is somehow different from the Law of God given by Moses to His people, your pastor is teaching heresy! You should run, not walk! Not from the mouth of YHVH” (Jeremiah 23:16). It is very simple to know if you’re listening to the words of a worthless prophet. But there is more. Not only must you stop listening to false teachers, but you must also repent of your sin. Yeshua says the same thing in Revelation. “As many as I love, I rebuke and chasten. Therefore be zealous and repent” (Revelation 3:19). If we will listen, He will make us spiritually rich. He will clothe us from our shame. He will heal our spiritual blindness. It’s not fun to be “rebuked” and told that we are living in sin. It’s not pleasant to be told that the bacon in our fridge is a sin (Leviticus 19:26, Leviticus 11:7-8). We don’t like to be told we can’t slander (Leviticus 19:16). We allow disobedience to parents (Leviticus 19:3, 32). We ignore the poor (Leviticus 19:9-10). 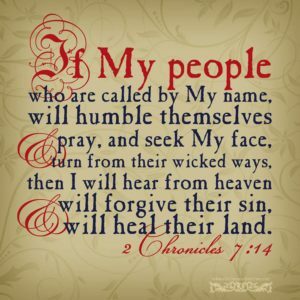 We lie, steal, break oaths, pervert justice, endanger the lives of others with our selfishness, eat GMO foods, get tattoos for those who have died, seek revenge and bear grudges, and allow idolatry in our homes and church buildings — all breaking commands from just one chapter of the Torah! We can’t fathom that all the churches meeting on Sunday, rather than resting on Sabbath according to His commandment (Leviticus 19:3, 30), are actually following idolatry and living in disobedience. How can so many sincere people be wrong? Easy — if they are blinded to the Word and are following the commands of men instead. “You shall not follow a crowd to do evil” (Exodus 23:2). And if we do what He commands, we will have fellowship with Him. He will heal us. Wow! That was an awesome word study journey! Thank you for sharing. His bride will honor Shabbat. His bride will know the clean from the unclean. His bride will know and follow the appointed times! His bride will be of the same Tribe! His bride will know repentance, understand mikveh and follow Him. That was an extremely “Well Done and Excellent” presentation. Great Scripture research used and quite amazing to how it all tied together with the WORD of GOD and the Messiah. This is AMAZING Anne, thank you for sharing! Just this week, I was in the scripture in Pro 29:18 “Where [there is] no vision, the people perish: but he that keepeth the law, happy [is] he.” I never took note before how a lack of vision in this verse is relating to people perishing. Look at the other ways the KJV translates this word “PERISH” – The KJV translates Strongs H6544 in the following manner: refuse (3x), uncover (3x), naked (2x), avenging (1x), avoid (1x), go back (1x), bare (1x), let (1x), made naked (1x), set at nought (1x), perish (1x). So, where we do not see, we become naked, and are uncovered. All throughout scripture, there is reference to nakedness and shame coming from not walking in the TORAH. Proverbs 29:18 goes on to say….”but he that keepeth the law,happy is he”. The root word for happs means to go straight, make progress, be blessed, to set right. Wow, thank you SO much, Tracey! Want to hear something else I learned since then? The word “vision” in Prov. 29:18 is related to the vision of prophecy. Where there are no prophets warning and exhorting us to keep Torah (or where the people aren’t listening to the prophets’ warnings), the people perish. Hi Beth! We had the same questions a few years ago and started praying and asking the Father to give us some answers. He started with the Sabbath. We searched long and hard to find biblical evidence that it was changed. We could not find a single verse. So out of obedience and love for God, not for salvation, we committed to walk as Messiah walked by remembering the Sabbath day and keeping it holy. From that point on we started discovering so much more about what Paul really taught in his letters, but it took time to reevaluate his words and we also took Peter’s warning to heart. See 2 Peter 3:15,16. Abraham is our example, he believed God and it was counted as righteousness, then he obeyed (was circumcised). Faith was always first and then obedience with your actions. This of course comes from a wiling heart who loves God. Keep searching and Messiah will show you! Blessings to you.